Kevin McKendree was born with an inherent, obsessive love of music. He began to play the piano at the age of three. Teaching himself by ear, listening to records by Little Richard, Jerry Lee Lewis, Ray Charles and other early Rock & Roll/R&B pioneers. When he was ten, inspired by B.B. King, he began to play the guitar. Throughout his teens his obsession led him to many different styles of music, which he brought to the many bands he played with. Kevin’s professional career began in 1987, when the seventeen year old’s talent was recognized by Peter Bonta, a long time Washington D.C. area music scene fixture and owner of Wally Cleavers Recording. Peter introduced him to many of the area’s top blues artists (including Big Joe Maher, Tom Principato, Bob Margolin & Mark Wenner). Very quickly, he became one of the most in demand musicians in the area. 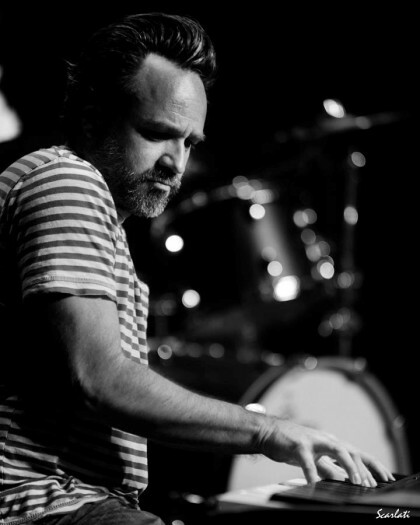 In 1997, Kevin joined Delbert McClinton as his band leader, playing on the Grammy winning albums, “Nothing Personal” and “Cost Of Living,” and the Grammy nominated album, “Room To Breathe.” Delbert’s easy touring schedule enabled him to have the best of both worlds in Nashville; recording sessions during the week and playing “live” on the weekends. At the beginning of 2011, Kevin stopped playing full time with Delbert in order to have a more flexible schedule and capitalize on the many other opportunities that were surrounding him. These included recordings and world tours with both Brian Setzer and John Oates, as well as producing album projects in his studio, The Rock House. Over the years, Kevin has played on hundreds of releases and performed thousands of times live with a wide range of artists, musicians and producers including: Little Richard, Delbert McClinton, Lee Roy Parnell, Seven Mary Three, Buddy Guy, John Oates, Anson Funderburgh, Vince Gill, Brian Setzer, Wynnona, Kix Brooks, Tom Dowd, Donald “Duck” Dunn, Earl King, Tinsley Ellis, Bonnie Bramlett, Randy Houser, Johnny Sandlin, Mike Henderson, Don Was, Kentucky Headhunters, David Hood, Johnny Adams, Jim James, Pam Tillis, Zigaboo Modeliste, Larry Graham, Hal Ketchum, T. Graham Brown, George Thorogood, Etta James…..and many, many more! You can catch Kevin, with the Mike Henderson Band, just about every Monday night at renowned Nashville venue, The Bluebird Cafe. You can also catch him performing with a wide variety of artists by checking the calendar at kevinmckendree.com. and a creative vibe. In Kevin’s words, “I wanted a place that lends itself to spontaneity, a place to make good music with my friends outside of the Nashville norm.” You can catch Kevin, with the Mike Henderson Band, just about every Monday night at renowned Nashville venue, The Bluebird Cafe. You can also catch him performing with a wide variety of artists by checking the calendar at kevinmckendree.com.